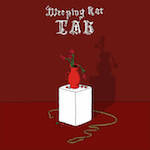 ‘Tar’ is the debut album from Melbourne’s Weeping Rat, on the quality driven Handmade Birds label. Given the labels previous output, it’s a surprise to see a release on the label by a band with its roots set firmly in Goth. This album was released initially on the Damned Gates label on vinyl in 2014 and this edition has a few extra tracks to sink your fake vampire teeth into. Opener ‘Silk in the Water’ starts off reminiscent to Joy Division in the pace of ‘Closer’, with vocals that have hints of Curtis (just hints mind) and follow up ‘Illusion’ rides strains of The Chameleons musically; and it’s refreshing to see. As the album progresses it steadily gets weirder until it falls over in a puddle of Death Rock, which I have little time for nowadays; but it’s still competent enough, even if the vocals become a mass of boring drones that wear a little thin. There isn’t much more to say about Weeping Rat than I already covered. They do exactly what they say on the tin; and there’s plenty here for any real Goths out there (if there are any genuine ones left) who should lap this up with gusto. This entry was posted in Dense Promotion, Handmade Birds. Bookmark the permalink.